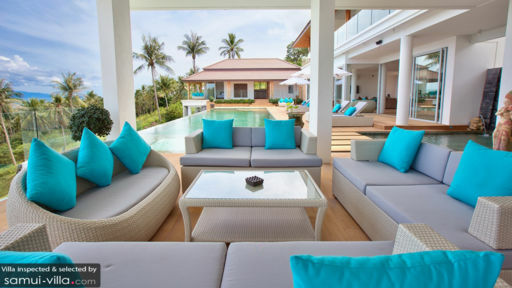 Villa Monsoon is a 6-bedroom luxury getaway found on the north coast of Koh Samui. This grand estate is set upon 32,000sqm of land and it features light-filled contemporary pavilions, surrounding the outdoor area and the glistering infinity swimming pool. Panoramic bay views, modern comforts, state of the-art entertainment and 5 star service is what you can expect when staying at villa Monsoon, promising an amazing holiday for large families and groups of friends. 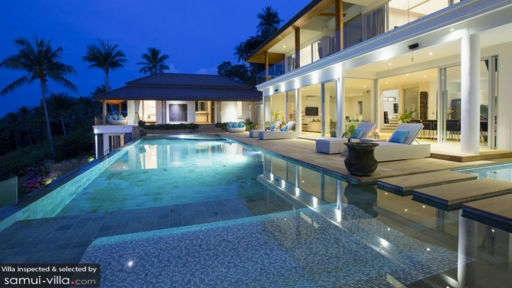 This villa houses not 1, not 2 but 3 decadent master suites found on the first floor with amazing views over the ocean. The rooms feature air-conditioning, large king-size beds and mood lightning to set the right ambience. In the walk-in wardrobe areas guests will find robes and slipper to wear after enjoying a nice hot shower or a relaxing bath in the en-suites. The three guest bedrooms are found on ground level and one of them is designed especially for kids for a small kitchen area. All the rooms come with comfy beds and air-conditioning. The enter piece of this villa is the stunning 18 meter infinity pool from where guests can gaze at the tropical landscape and ocean with the island Koh Phangan and Ko Tao as the backdrop. The pool is encompassed by a stone sun-deck with white rattan loungers for those wanting to work on their holiday tan while the kids can splash around in the shallow shady kiddies pool. The breezy shaded verandah is furnished with a white rattan lounge area, perfect for enjoying sunset cocktails and grilled delights of the garden BBQ. Villa Monsoon also features a tennis court on premises. The light-filled living room of villa Monsoon features air-conditioning and glass doors, folding open to the breezy terrace outside. The space is furnished with a deluxe U-shaped suede sofa, a large LCD flat-screen television with satellite channels and a 12-seater dining table. The villa also features a fully equipped western kitchen with a bar and stools to enjoy coffee in the morning and some ice bold beers in the evening. Guests have access to a fully soundproof cinema room where they can watch movies with popcorn and coke and outside on the veranda there is a billiard table to play a game or two after the kids have gone to bed. Villa Monsoon is fully staffed with a professionally trained and dedicated team, going out their way to make a stay at this gorgeous luxury villa most pleasurable. The team consists of a good English speaking villa manager and 3 housekeeping staff. An excellent chef and spa therapist can be arranged for guests upon request. Babysitters are available for an hourly rate. The villa has CCTV at all entrance points. 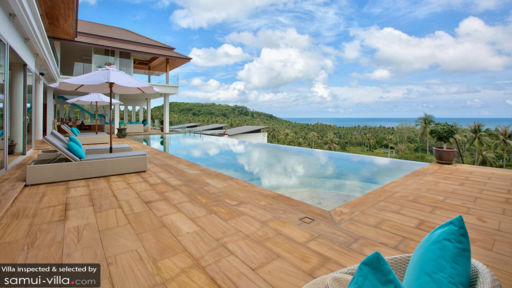 Villa Monsoon is located in the north of Koh Samui in the Gulf of Thailand. The nearby beaches of Bang Por makes wonderful places to swim, snorkel and enjoy ocean front meals at one of the restaurants. KruaBangpor restaurant offers excellent authentic Thai cuisine. This part of the island is still quiet and peaceful, however if guests want to go out in the evening, they can drive ten minutes to the village of Bophut or twenty minutes to the center of Chaweng, the main tourist town of this island.